None of the key non-native alien species on the Kennet is easy to eradicate – but a good programme for control will target species preventing ‘good ecological status’ or causing deterioration. White-clawed crayfish, which are native to the UK, are now seriously endangered, thanks to the spread of their cousins from across the pond – the much larger and more aggressive American signal crayfish. American signal crayfish (Pacifastacus leniusculus) not only drive out native white clawed crayfish as they compete for food and habitat, but also carry a water-borne fungus which is fatal to our native species. It is predicted that white clawed crayfish could become extinct in the UK within decades if efforts are not made to protect them. Himalayan balsam is a native of the western Himalayas. Introduced to Britain in 1839, it escaped from gardens and rapidly colonised river banks and areas of damp ground. It is the tallest annual plant in Britain, growing up to 3m high. The characteristic purplish-pink slipper-shaped flowers appear in June. 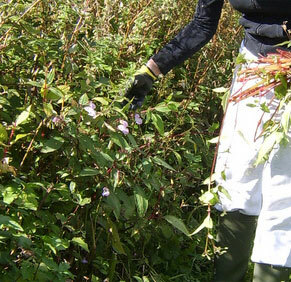 Himalayan balsam plants grow in dense stands that suppress the growth of native grasses and other flora. In autumn the plants die back, leaving the banks bare of vegetation, and therefore liable to erosion. 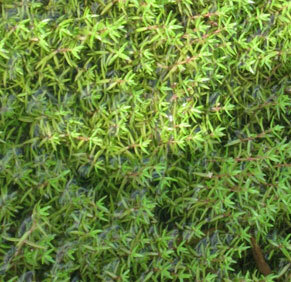 Water fern is a floating aquatic plant native to tropical America and is the only floating fern in Britain. 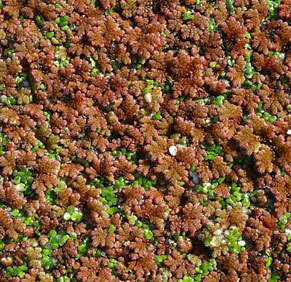 The leaves of water fern are no bigger than 2.5mm – forming small plants around 2.5cm long which cluster to form a dense mat and reduces oxygen levels in the water. Water fern floats on the surface of the water by means of numerous, small, closely-overlapping scale-like leaves, with their roots hanging in the water. The plants are so small, at no bigger than 2.5cm, that it can easily be transported on other plants as a contaminant. Japanese knotweed was first brought to Britain in the mid-nineteenth century as an ornamental garden plant. Since then it has caused serious problems in a range of habitats – particularly roadsides, riverbanks and derelict land – by displacing native flora and even causing structural damage. 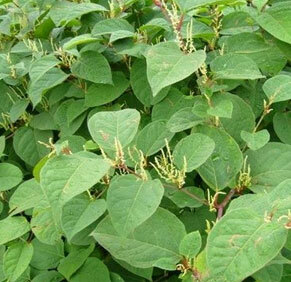 Every year, Japanese knotweed causes £150 million worth of damage and disruption throughout the UK. Some waterways become choked, railways need constant attention and many development sites become overrun by the plant. In 2010, the government licensed the release of a biological control against Japanese knotweed. This species was first introduced for sale in England in 1927. Since the late 1970s it has spread rapidly north and west. Between 1970 and 1986, it was recorded in 33 10km squares in Britain and Ireland. It is now widespread in England, where it is causing difficulties. 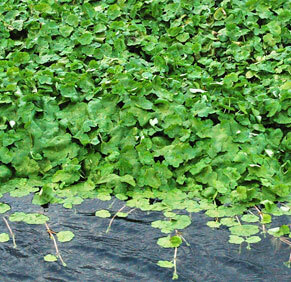 Floating pennywort was first brought to Britain in the 1980s and is still sold as a plant for aquariums and garden ponds. It now grows in the shallow margins of slow-flowing water bodies (particularly ditches, slow flowing dykes and lakes), and forms dense interwoven mats of vegetation, which can often be mistaken for solid ground. These mats quickly cover the water surface, ruining the habitat for other wildlife. 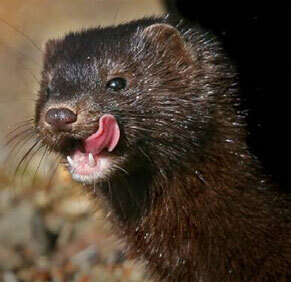 Mink are native to North America but were bought into Britain in the early 20th century to be bred for their fur. By the 1950s mink escaped from fur farms and spread throughout the country. They usually hunt for food in woodlands and near watercourses and eat fish, small mammals and birds. They also prey upon poultry on farms and fish stocks in lakes. Mink often need to be controlled because of the damage that they can cause to wildlife, fisheries and property. They are a particular danger to our native water voles, which are protected in this country. Currently mink are trapped and destroyed to minimise the damage they can wreak on our native species. The River Basin Management Plan contains 25 generic measures relating to invasive non-native species. There is still much work to be done in identifying lead responsibilities for alien species, and further research required on the eradication or management techniques for some of the more problematic species. Some of this work will be done at a national level, and the immediate priorities for the Kennet will be informed by developments in alien species policy and practice in the next year or so. Providing advice and training on identification, control and disposal of invasive non-natives. Working with existing bodies to identify and eradicate non-native species. Developing an alien species action plan for the Kennet catchment. Working to achieve eradication and control within SSSI and Natura 2000 sites (on Kennet and Lambourn). Participating in a river-basin wide invasive non-native species forum. 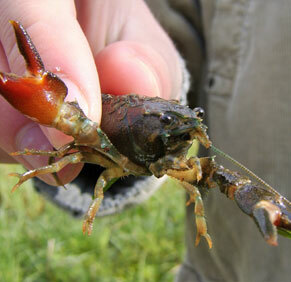 Undertaking further analyses to better elucidate the role of signal crayfish in ecological deterioration. There are opportunities for working in partnership with other organisations in the delivery of these actions, particularly with delivery of advice and training to support ‘spotters’, and to physically help with control and eradication. This is happening in some areas already through the Wildlife Trusts.